A lot of us seem to have an innate drive to understand the workings of our own brains. The whole field of psychology, and later, neuroscience, grew out of a need to figure out how the electrical firings of the 1.5 kilograms of gray matter inside our skulls turns into everything we experience, think, respond to, and desire. 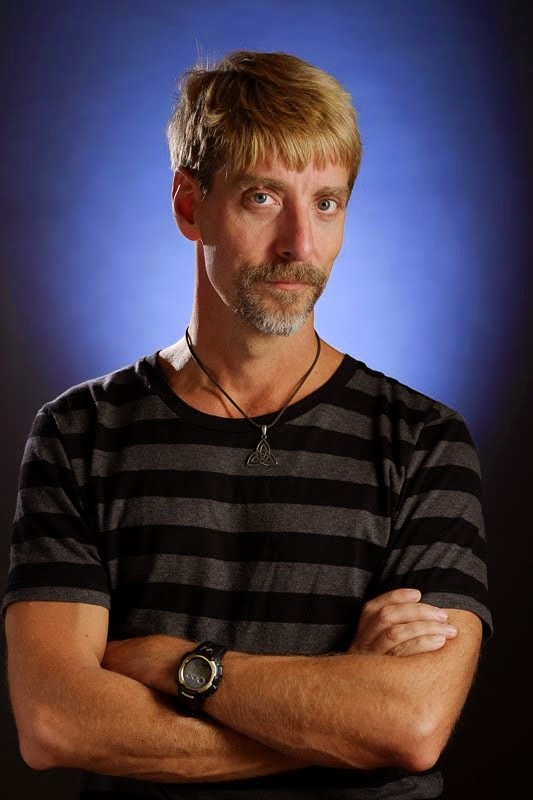 This same impulse, I think, also has been a big factor in the persistence of a lot of pseudoscience -- the popularity of astrology and divination comes, I think, as much from the human desire to know ourselves as it does from our wish to know the future. It's also given birth to some gray-area practices, such as personality assessment tests. I was just talking yesterday with some students about one of these -- the Alignment Test (take it yourself here), which asks you 36 questions and then places you into one of nine categories: Lawful Good, Neutral Good, Chaotic Good, Lawful Neutral, True Neutral, Chaotic Neutral, Lawful Evil, Neutral Evil, and Chaotic Evil. You can then read the description of yourself, find out others (especially fictional characters) who fall into that classification, and so on. A neutral character does what seems to be a good idea. He doesn't feel strongly one way or the other when it comes to good vs. evil or law vs. chaos. 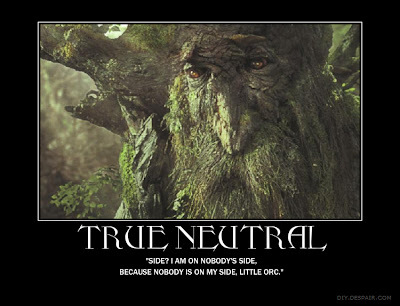 Most neutral characters exhibit a lack of conviction or bias rather than a commitment to neutrality. Such a character thinks of good as better than evil-after all, he would rather have good neighbors and rulers than evil ones. Still, he's not personally committed to upholding good in any abstract or universal way. Some neutral characters, on the other hand, commit themselves philosophically to neutrality. 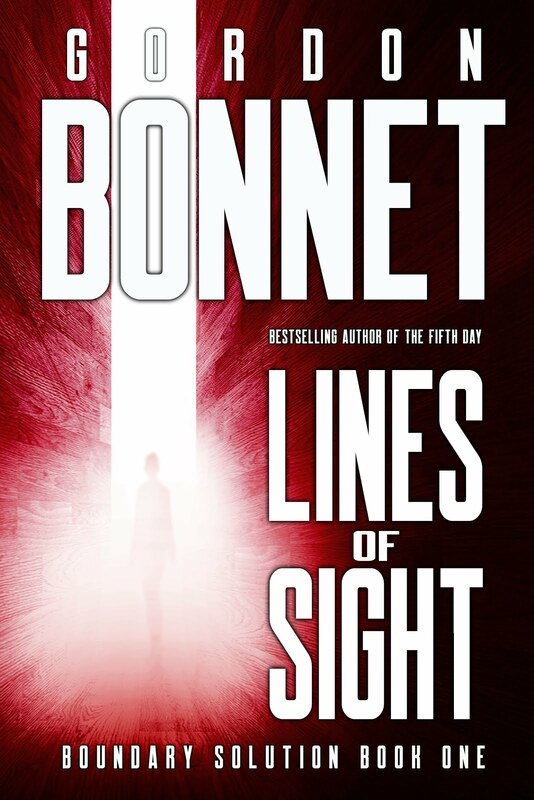 They see good, evil, law, and chaos as prejudices and dangerous extremes. They advocate the middle way of neutrality as the best, most balanced road in the long run... The "true" neutral looks upon all other alignments as facets of the system of many things. Thus, each aspect--evil and good, chaos and law--of things must be retained in balance to maintain the status quo; for things as they are cannot be improved upon except temporarily, and even then but superficially. 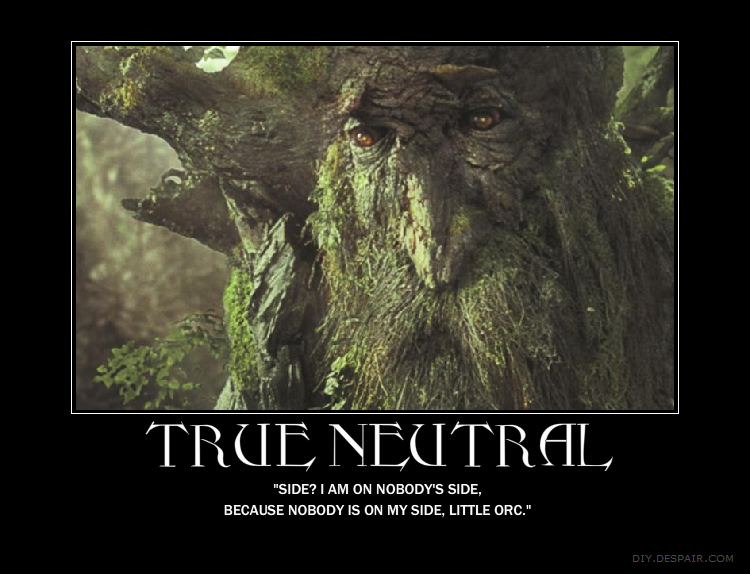 True neutral characters are concerned with their own well-being and that of the group or organization which aids them. They may behave in a good manner to those that they consider friends and allies, but will only act maliciously against those who have tried to injure them in some way. For the rest, they do not care... If someone else is in need, they will weigh the options of the potential rewards and dangers associated with the act. If an enemy is in need, they will ignore him or take advantage of his misfortune. True neutrals are offended by those who are opinionated or bigoted. A "hell-fire and brimstone" lawful good priest is just as offensive as a neutral evil racial supremacist in their eyes. They do not necessarily strive for philosophical balance. In fact, they may avoid philosophical considerations altogether. A true neutral may take up the cause of his nation, not because he necessarily feels obligated to do so, but because it just makes sense to support the group that protects your way of life. True neutrals tend to believe in lex talionis forms of justice. Anyway, all in all, I'm pretty happy about this, even though I know that (1) it's based on my own self-assessment, which may or may not be accurate, and (2) dividing all personality types into nine pigeonholes is kind of silly. After all, even the astrologers admit that there are twelve. The problem is -- in fact, the problem with all of this is -- type theory has no particular basis in science. As far back as 1989, research by behavioral scientists Robert McCrae and Paul Costa concluded that "there was no support for the view that the MBTI measures truly dichotomous preferences or qualitatively distinct types." More recently, David Pittenger, a researcher in psychometrics at Marshall University, said, "Although the MBTI is an extremely popular measure of personality, I believe that the available data warrant extreme caution in its application as a counseling tool, especially as consultants use it in various business settings." Critics have claimed that its widespread use is unjustified -- as Michael Moffa pointed out, in his article "A Critique of the Myers-Briggs Type Indicator," mainly because it gives results that are unreliable. Individuals given the MBTI twice, with a five-week wait between testing, show as high as a 50% likelihood of falling into a different type the second time they're tested. This by itself is extremely problematic, and makes you wonder why it's still used. It may, Moffa wrote, be simply "popular because it's popular." Really, though, the problem is the weight that the results are given. Human personality is a remarkably complex, changing, and difficult-to-pin-down thing, and any hope that we can classify humans using nine, twelve, sixteen, or even a hundred designations is probably doomed right from the outset. So, as a skeptic and a scientist, I do tend to cast a wary eye on such assessments; but put in their proper light, I think they can be instructive. It can't be denied that personality tests are kind of entertaining, and if along the way, they give you some insight into how you think, then that's all to the good. The maxim "Know Thyself," after all, has been a guiding principle for a long time. 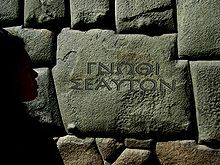 It is for good reason that it's inscribed on the front wall of the Temple of Apollo at Delphi. All of which probably seems pretty wishy-washy, for a guy who usually prides himself on thinking critically. It's not my fault, of course. 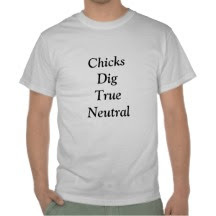 All of this ambivalence is just because I'm a "True Neutral." Not that there's anything wrong with that, right? Being an ISFP makes up for it, right? I bombed out on question 1. My answer would be: Evaluate whether their disapproval is valid and react appropriately. But was that a choice? No! Yeah, I didn't see an answer I liked on a lot of those questions.